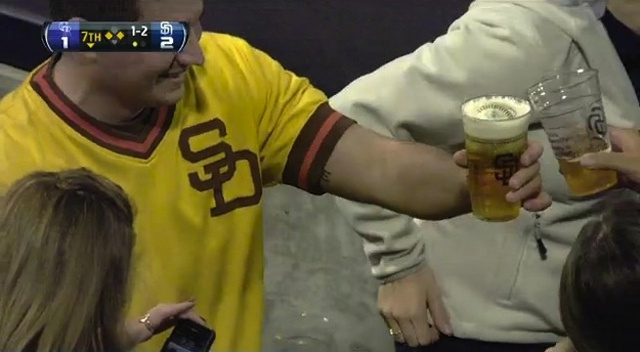 Baseball fan catches Ball in beer cup! You’re at a Seattle Mariners’ game with your buddies and a fly ball comes your way. Problem is, there’s a full draft beer in your hand and those things aren’t cheap. But catching a foul ball is a story you can tell for life, so you throw caution, Budweiser and your $9.50 to the wind and try to nab the ball inside your plastic cup. Your plan works and you’re a stadium hero! But what comes next? Life has prepared you to catch the foul ball but not how to cope afterward. a. Immediately dump the beer on the ground to preserve the ball? b. Reach inside the cup and delicately retrieve the ball, then continue to drink the beer? c. Keep the beer and ball together just to see what happens. d. Slowly see how many sips of beer it takes to get to the center of the ball, making it like an alcoholic-beverage version of a Tootsie Roll Tootsie Pop. Ahh, the ol’ “chug the beer quickly and have it spill all over your shirt, either because chugging isn’t your thing or because the beer displaced by the ball caused for untenable chugging conditions.”The hints of rawhide made it a special taste adventure, I’m sure. At least his friend next to him was fully supportive the whole time.